On 5th June 1976 Clare Francis set out from Plymouth Sound in her yacht - Robertson's Golly. She was competing in the Royal Western/Observer Singlehanded Transatlantic Race. 29 days later, on Sunday 4th July, she sailed into Newport Rhode Island becoming the first woman to finish. She had encountered terrible weather conditions and finished with her self streering gear broken but she had the title of the fastest and smallest woman (7.5 stone, 5' 2") in the race. Thirty years on, and the yacht is now owned by the Meridian Trust. It underwent repairs in Lymington before sailing to Portsmouth in May this year. I was lucky enough to be invited to sail on one of her first voyages since the repairs. 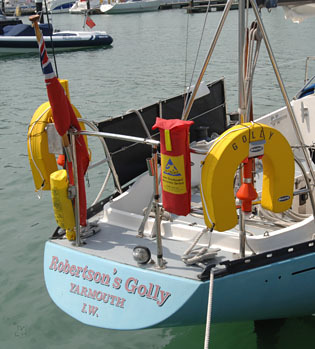 On 28th June 2006, in warm sunny weather, the Robertson's Golly took us across The Solent to the Isle of Wight. For members of the Yahoo! Group GollyBCII who would like to see the yacht then we planned a SLC at Portsmouth which took place in September 2006. At the start of the day, moored at Gunwharf Quays, Portsmouth. Three hours after departing from Portsmouth we arrived at Cowes, Isle of Wight. Portsmouth City Council are currently trying to get the small Golly image/logo on the side of the yacht covered. The yacht is registered as the Robertson's Golly, so the name itself is not an issue. Clare worked for James Robertson & Sons in the marketing and market research department from 1972. Later, having concentrated on her sailing and looking for sponsorship, Robertson's as her previous employers offered her their support. The Golly logo was on the original yacht and therefore has historical significance. There are plans to return the colour of the hull to white as it would have been when Clare sailed her. 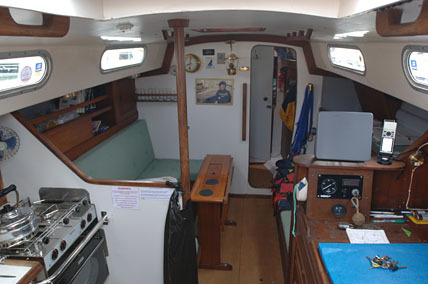 The cabin has changed little, as can be seen from some of the images in her book, "Come Hell or High Water". The covers on the seats will be changed to the same blue as Clare's bed. The new sleeping area was where Clare stored her food and supplies. This can be seen through the doorway (photo on the right), Clare's actual sleeping area was very small. There were six of us on board, and the four men all worked sailing the boat; we marvelled at how Clare had managed to do everything single handed. Having had a go at steering Golly, you can appreciate that her remote control steering device would have been essential to allow her to perform other tasks. The Robertson's Golly is an Ohlson 38 - a 38 foot yacht designed by Einar Ohlson. An Ohlson 38, Robertson's Golly was built in 1974 by Tylers of Maidstone (no longer in business) and bought as a hull by Ron Green, a building contractor of Sanderstead, Surrey. Ron had it moved to his garden and fitted out there to his own specification by his workmen. His carpenter was a real craftsman, as can be seen by the quality of the teak fittings in the accommodation. 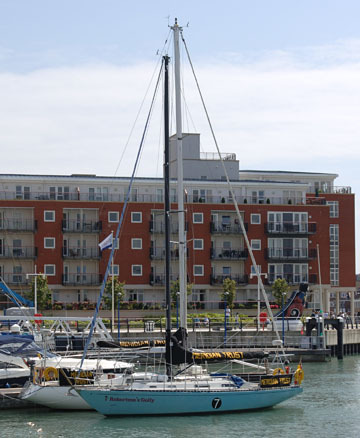 Originally the boat was named "Battle Royal of Chichester" as Ron was a prominent member of Chichester Yacht Club. Wanting the boat to be raced, he lent her to Clare Francis for two years so that she could prepare her for and enter her in the Observer Single-handed Transatlantic Race in 1976. 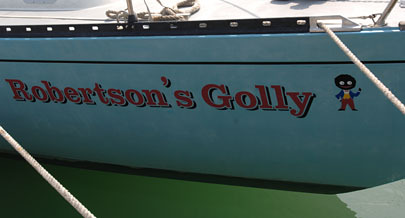 Clare obtained sponsorship from her previous employers, James Robertson & Sons (Preserve Manufacturers) Ltd, so the boat's name was changed to "Robertson's Golly". The Golly had been the company's logo for over seventy years. In June 1975 Clare entered the Golly in the Azores and Back race and finished eleventh out of fifty-four starters. This qualified her for the OSTAR the following year. In this race she finished thirteenth overall out of 125 starters taking the Ladies' Prize and beating the women's single-handed transatlantic record by three days. 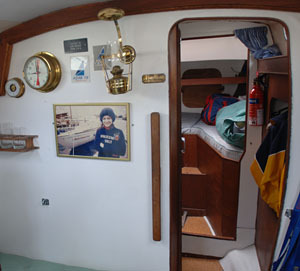 The Golly had pride of place outside the entrance to the London Boat Show the following January and Clare was featured in an episode of the TV serial "This is Your Life" hosted by Eamon Andrews. After the racing Ron Green took the Golly back and cruised her extensively in the Channel for many years. He died in 1995 and his family, wanting to keep in touch with the boat, asked Ian Dallison if he would like to take her over. 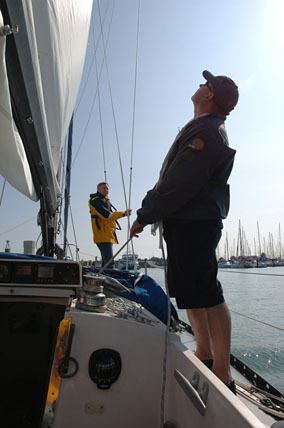 Ian had been a family friend for some years and had sailed on the Golly a number of times. A member of the Royal Solent YC, he lives in Yarmouth, Isle of Wight, so that was the boat's home for the next ten years. Although, inevitably, some changes were necessary, particularly to the instruments, Ian tried to retain the basic character of the boat and then cruised her extensively in the western Channel. Advancing years and declining mobility obliged him, reluctantly, to sell the boat in 2006 to The Meridian Trust. Fortunately, bearing in mind its history, the boat has been allowed to keep her distinctive name and logo. On acquiring the vessel, Ian contacted Robertson's and was assured that they had no objection. Again, in 2001, when Robertson's decided to drop the Golly as their logo in favour of something a bit more recognisable to today' children, (i.e. characters by Roald Dahl), it seemed only correct to ask the company whether they would wish to continue their association with the boat. Fortunately they replied that they were "---proud of the role that the Golly has played at Robertson's over the last 73 years and proud to have supported Clare Francis in the Observer Single-handed Transatlantic Race.----we are entirely happy for you to continue to use the name "Robertson's Golly" on the yacht and wish you fair winds for all your future endeavours in her." So political correctness had nothing to do with it! 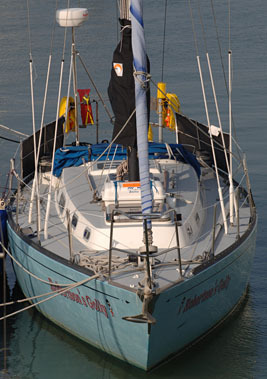 The 'Meridian Trust' subsequently changed it's name to 'The Meridian Sailing And Training Trust Limited' and was dissolved in 2010. The Robertson's Golly yacht was returned to Ian Dallison. It is now sailing with Around and Around.